The Sinks, 2018 Oil on canvas 32x32"
In 1950 with the announcement of the construction of a state bathhouse on the "New Beach" at Provincetown, steps were already being taken to prevent the "honky tonk" influence from creeping in via "mobile hawkers" or any "catch penny device". Never the less the bathhouse was constructed and open to the public in 1953. "Furdu-strand-ir" (wonder strands) was the name given to the beach 953 years ago in the Viking saga while the same stretch was long and widely known as Herring Cove Beach when early Provincetown fishermen landed their catches there to have them hauled over the dunes and into town by horse and cart. In 1865 Henry David Thoreau writes “…three ships containing "one hundred and sixty men and all sorts of live stock" (probably the first Norway rats among the rest), having the land "on the right side" of them, "roved ashore," and found "Or-œfi (trackless deserts)," and "Strand-ir lang-ar ok sand-ar (long narrow beaches and sand-hills)," and "called the shores Furdu-strand-ir (Wonder-Strands), because the sailing by them seemed long." Other names to the stretch of beach where the future bath house was to stand include “New Beach” and “Hell Town”. In the Cape Cod Pilot published in 1937 it was called “Outermost Beach” and in some Navy charts it is indicated as the “Measured Mile Beach”. It has also been noted as the "Beach of Jewels" by artists because of the color of the pebbles found under the water at the beach. In the recent years leading up to the eventual demolition of the 1950's Bathhouse, Seashore Superintendent George Price was reported to refer to the neglected bathhouse as a "sand-colored Cold War Bunker." 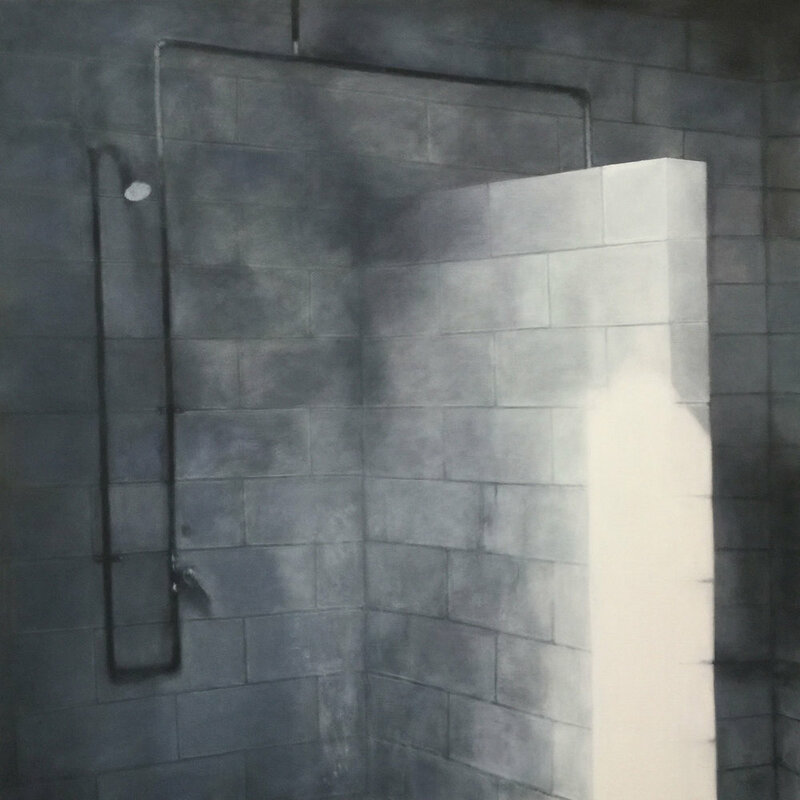 In "Building Provincetown", David Dunlap refers to the state - built bath house as a "handsome-enough modernist structure" that could have passed for a "small-town airport terminal." 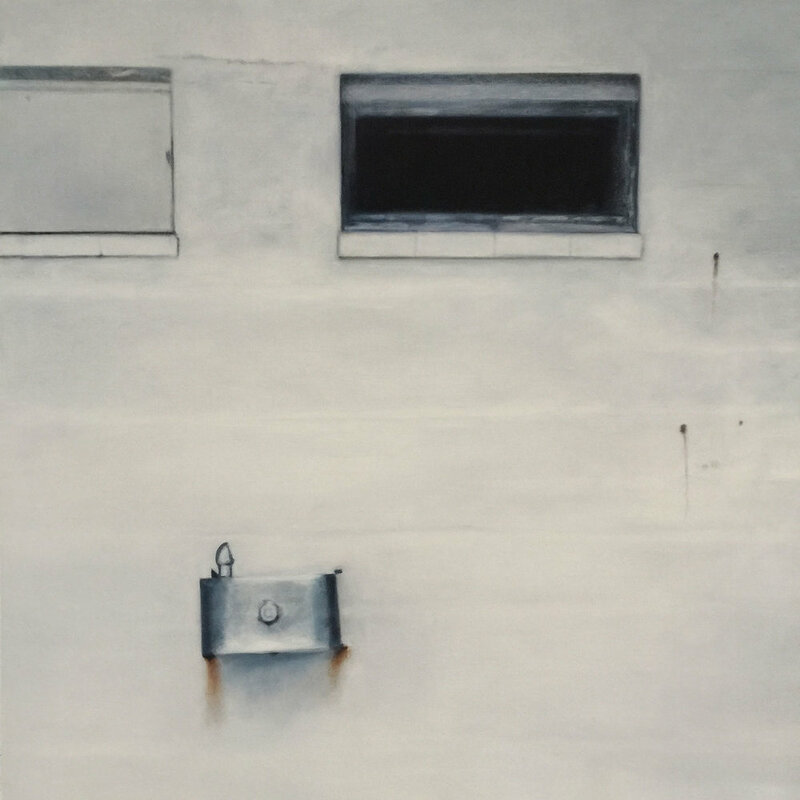 The Water Fountain, 2018 Oil on canvas 32x32"
On the first floor were restrooms, showers, rooms for lifeguards and a shaded eating area. By 2012, the sinks were rusted, pavement cracked, the paint on hand rails were chipped and held together with Duct tape. The second-floor windows were boarded up with grayed plywood, and parts of the building could not be used at all because they were considered unsafe. A concession stand in equal disrepair was located in a separate building next to the bathhouse. The Herring Cove Beach Bathhouse project started in the fall of 2012 with the demolition of the previous 1950's era concrete bathhouse constructed by the Commonwealth of Massachusetts and designed by Mario Caputo. The concrete block house design was in response to the 1938 Hurricane and was intended to withstand coastal storms.The current design is also in response to storms, sea level rise and climate change as an adaptation approach.The structures are designed to sustain 150 mph winds, are constructed on pilings to allow storm surge waves to pass underneath, and could be re-located in the future if erosion threatens the facility. The Herring Cove Bath House is handicapped accessible with beach wheelchairs available upon request from local life guards. 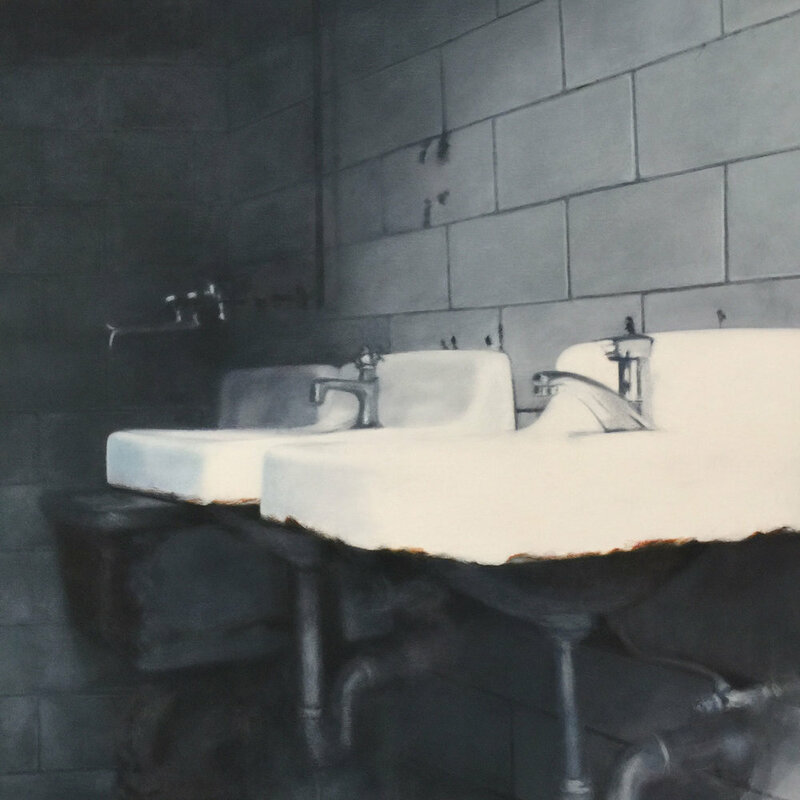 The paintings in this exhibit are a tribute to the 1950's era bathhouse and the concession stand that withstood the test of time and neglect providing millions of visitors with a restroom, a place to shower and change and perhaps a hotdog, a grilled cheese and a good humor ice cream. 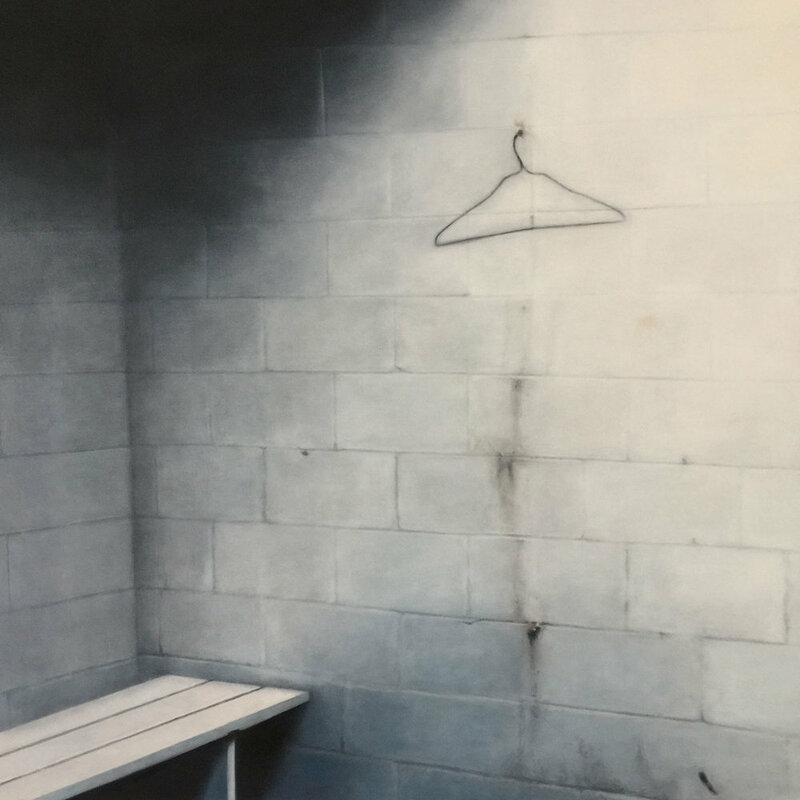 The Shower, 2018 Oil on canvas 42x42"
The Hanger, 2018 Oil on canvas 42x42"
The Mop, 2018 Oil on canvas 42x42"
The Concession Stand, 2018 Oil on canvas 32x32"